In the late 1940s, a radio executive declared, “The housewife is the heart and backbone of America’s vast daytime radio audience.” Women could perform all of their daily household activities while simultaneously keeping up with their favorite radio soap operas and advice programs. However, television executives weren’t sure if the American homemaker would turn on television in the morning just as she did radio, and leave the set on throughout the day. Television is a visual medium and, unlike radio, demands your attention. Would homemakers drop what they were doing to watch daytime TV? It was a gamble the executives were willing to take. Detroit television in the 1950s was host to a mélange of local morning programs aimed at the female audience. From the Lady of Charm and Hello Girls to Ladies Day with Chuck Bergeson the daytime hours were full of programs with a decidedly feminine flair. 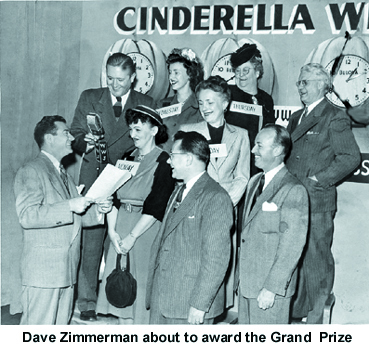 One of the earliest local quiz programs on Detroit TV aimed at the female audience was Cinderella Weekend. The show originated live from the main auditorium of the WWJ studios and was the first program in the Midwest to be simulcast on both radio and television. The daily program debuted on WWJ radio in 1948. Later that year the Friday broadcast was simulcast on WWJ-TV. 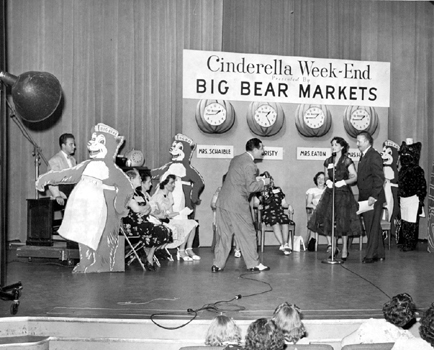 The show went to five days a week on television in 1950, sponsored by Big Bear Market. Cinderella Weekend was an early franchise show, created and developed by V.I.P. Service; Inc. V.I.P. supplied the scripts, prizes and product giveaways. In turn, WWJ paid a fee for the broadcast rights. WWJ was one of a dozen stations in the country that aired the program. The show’s quizmasters in Detroit were Johnny King and Dave Zimmerman. Johnny King was known as “Detroit’s Irish Tenor.” Before coming to Detroit he travelled the country, singing and playing banjo and saxophone with the Paul Whiteman and Glen Gray orchestras. King was the emcee at the famed Bowery nightclub in Hamtramck for seven years, and on WWJ radio he accumulated more airtime than any other Detroit performer. Dave Zimmerman was a long time announcer at WWJ. He hosted the popular WWJ radio program Coffee Club and was on the air for Detroit’s first television broadcast from the 47th floor of the Penobscot Building. Before each show, a panel of four women was chosen from the audience. Each contestant sat in front of a pumpkin shaped clock set for the magic hour of midnight. During the program each contestant was asked a series of questions. Every correct answer advanced the clock 15 minutes. The woman with the most time on her clock at the end of the program was the day’s winner. Daily prizes such as jewelry, cosmetics and appliances were awarded. The winners of the first four programs during the week returned on Friday to compete in a playoff. The grand prize winner was whisked off set with a friend of her choosing in a pumpkin coach to begin her three-day “Cinderella Weekend” in New York City. The trip began as soon as the credits rolled for the Friday show. Before leaving Detroit the winner would receive a complete wardrobe and makeover. Then the lucky Cinderella of the Week and her guest were whisked by cab to Detroit City Airport, where they hopped the next Capitol Airlines flight to the Big Apple. The weekend for two included breakfast in bed, hotel and nightclub reservations, theater tickets, a tour of the city, dancing lessons and lunches and dinners at New York’s top restaurants. The winner was given $35.00 to cover tips. Cinderella and her companion returned to Detroit on Sunday evening and appeared on the show the following Monday to talk about the trip. By the time the last show aired in 1953, WWJ sent more than 500 prize winners to New York City, had more than 300,000 visitors in the WWJ auditorium and gave away more than one and a half million dollars worth of prizes. Cinderella Weekend provided many women with their first airplane trip, a second honeymoon, or just a chance to be treated like a princess.